"…I think the goal is don’t hold anything back, every year put all you have into production, all you have into ideas, don’t save anything. You put everything you have in every year and it forces us to find a way to top it the next year." Dierks will be joined in support by Jon Pardi & Tenille Townes! 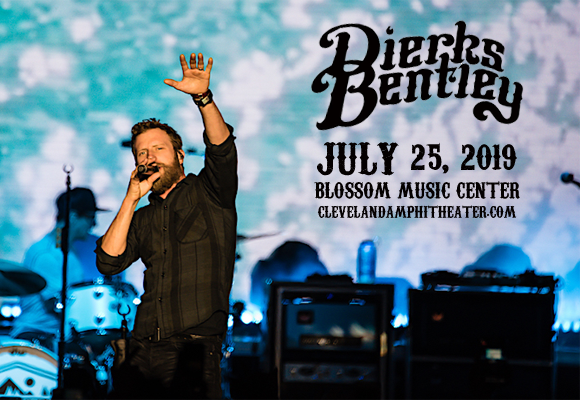 Dierks Bentley is a fourteen-time Grammy Award-nominated country singer and songwriter. Bentley found instant success with his self-titled 2003 debut album, which peaked at number four on the Billboard Top Country Albums chart and number 26 on the Billboard 200. The album was also registered platinum by the RIAA, after selling over one million copies. Bentley followed with 2005's Modern Day Drifter, which was also certified platinum, and 2006's Long Trip Home, which was certified gold. To date, Bentley has charted sixteen number-one and six top five singles on the Billboard Hot Country Songs and Country Airplay charts, and has released ten studio albums, his most recent being 2018's The Mountain.